Betnesol-N is produced by GSK, which contains betamethason sodium + phosphate B.P + Neomycin Sulphate B.P. 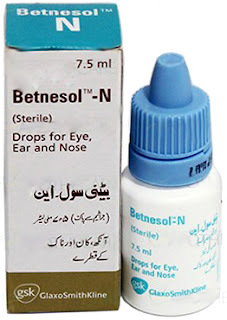 It is being used for the treatment of eye, ear and nose infection caused by bacteria. Eye: Used for red and pink eyes. Ears: Otitis externa and other steroid responsive inflammatory conditions where bacterial infection is present or suspected. Nose: Steroid responsive inflammatory conditions where infection is present or suspected. It is sterile, free from bacteria and microorganism. Indications: Use when inflammation and bacterial infection take place. Precautions: Do not use more than seven (7) days and in pregnancy. Adverse Events: Thinning of cornea leading to perforation, cataract and excessive intranasal usage may include systemic side effects. Take Augmentin 625mg Tablet two times a day..
Hope you are above 18….